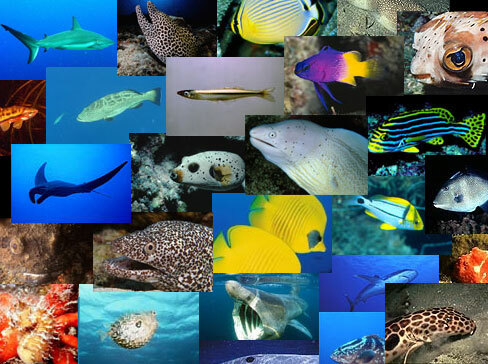 There are approximately 27,300 species of fishes described by science. Many species have yet to be described and still others are likely entirely unknown. Estimates of the actual diversity of fishes vary, although many agree that in total there are probably about 31,500 different kinds of living fishes. There are more kinds of fishes than all the other groups of vertebrates combined. An anadromous (“a-na-drom-ous”) fish is born in freshwater, moving from freshwater to salt water, and then returning to freshwater to spawn (reproduce). An example is the salmon. A catadromous (“ca-ta-drom-ous”) fish is just the opposite. These fish are born in saltwater, spend most of their lives in freshwater, and return to the saltwater to spawn. 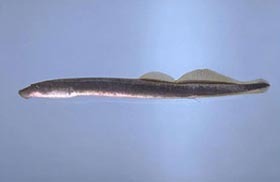 The American eel is an example of a catadromous fish. What is the world's largest fish? What is the world's smallest fish? 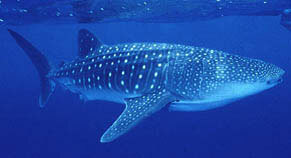 The largest fish in the world is the whale shark Rhincodon typus. It can grow to more than 50 feet in length and can weigh several tons. 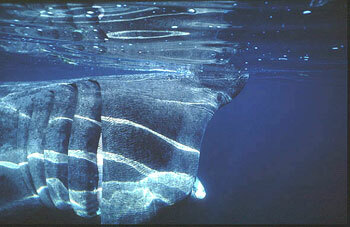 The second largest fish is the basking shark (Cetorhinus maximus) which can grow up to 45 feet in length. The smallest fish in the world lives among the coral reefs of the Indo-west Pacific. The scientific name of this fish is Trimmatom nanus. It grows to only 1 cm in length. That depends on the fish species. Fishes can live a few weeks or months (some of the small reef fishes) or in excess of 100 years (as in certain beryciform fishes). How long an animal lives is referred to as its longevity and there is not a great deal of longevity information known, with respect to all fish. How is the age of fish determined? Scientist are able to determine the age of fish by counting growth rings. 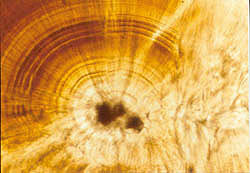 These growth rings are found on vertebrae, otoliths (ear bones), and some types of scales. While many bony fish can be aged with scales and otoliths, elasmobranchs, which lack otoliths and suitable scales, are typically aged using vertebrae. The cause of the ring formation is not known, but may be related to seasonal changes in the environment or some endogenous cue such as hormone levels. There are typically two types of growth rings, wide opaque rings usually representing summer growth, and thin translucent rings usually representing winter growth, with one pair of rings representing one year of growth. However, before scientists can accurately age the animal, they must verify when the rings are deposited on the vertebrae, otolith, or scale. What is the oldest class of fish, as a class? 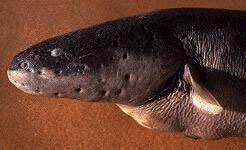 The most primitive group of fishes alive today are the Agnatha which includes hagfishes and lampreys. These animals never developed biting jaws, like humans. Hagfishes and lampreys are bottom dwellers, slimy, completely lack scales of armor, and are long and eel-like. Lineages from which these fish were derived date back to the Paleozoic. Ancestral hagfish and lampreys date to the Carboniferous period, 350,000,000 years ago. Biologists are very interested in these animals because their body characteristics such as their shape and function help explain the evolutionary processes that have lead to the more advanced forms of fish we see today. The common names of fish vary from place to place and this makes it very difficult for people to differentiate among species. For example, blacktip sharks are called “common blacktip shark” in Australia and “requiem shark” in the United Kingdom. A uniform naming system is a much easier way to differentiate among species regardless of how many common names they have. The system used to name the 30,000 or so fishes of the world is called “the binomial system of nomenclature”. Through this system a fish is given a Latin scientific name, which is usually made of two parts: the genus and species, or three parts if a subspecies has been described. The genus name applies to a group of species displaying basic characteristics while the species name is based on a few characteristics that apply to one species which is distinct from all others. Fishes breathe by means of highly vascularized tissues known as gills. As water passes over the fine gill membranes, the fish absorbs the water’s oxygen content. Gills contain a network of fine blood vessels (capillaries) that take up oxygen and diffuse it through the membranes. A wide variety of fishes have evolved the capability to breathe atmospheric air, including walking catfish (Clarias batrachus), and tarpon (Megalops atlanticus), as well as the betta (Betta splendens), a popular aquarium fish. No. Most fish swim horizontally, however there are many exceptions. 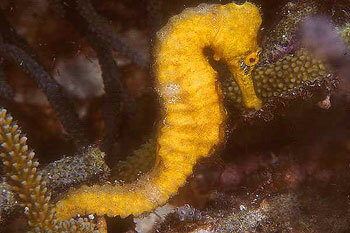 The shrimpfish and seahorse are two fishes that swim vertically. 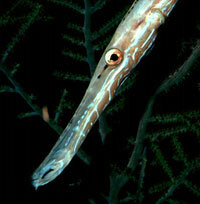 Indo-Pacific shrimpfish (family Centriscidae) form schools and swim vertically with their tube-like snouts directed upward. Other fish include a variety of midwater deepsea fishes that swim and/or rest vertically. Fish do not chew their food the same way we do. Many carnivorous fishes (meat eating) use their sharp teeth to capture and hold prey while swallowing it whole or in large pieces. We use teeth to grind food into tiny pieces, and then we swallow. Bottom dwellers such as rays have large flat teeth that crush the shellfish they eat. A number of herbivorous fishes (grazers) grind their food in a manner similar to humans. However, the tooth-like grinding mills are located in the throat rather than in the mouth, and are referred to as pharyngeal (“phar-yn-geal”) teeth. Many fishes are able to see color, however some colors do not penetrate into deep waters. Blue is more easily seen at depths than other colors such as red and yellow. This is why many deepwater fishes are red in color. This red coloration makes them more difficult for predators to see. Fish have cone cells in their retinas, which are the color receptors in many organisms including humans. It is believed that fish perception of color is very different than ours. There are flatfishes that have eyes on the left side (sinistral) and those with eyes on the right side (dextral). 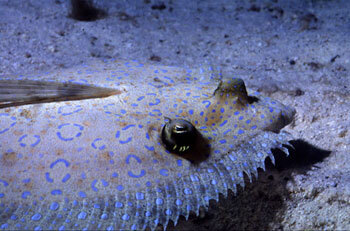 Flatfishes include flounders, tongue soles, and turbots. Rarely, individuals of some species of flatfishes may be sinistral or dextral. 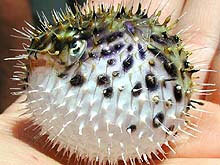 All puffer-like fish inflate by pumping water or air into special sacs, causing them to take on a balloon-like appearance. This behavior is thought to be an anti-predator response. An electric eel can give an electric charge of more than 350 volts, and some large individuals have been recorded to discharge as high as 650 volts! Moray eels are fish that have well developed teeth, and lack scales and pectoral fins. Moray eels live in tropical and subtropical ocean waters of the world. In the United States, they are mostly found in Florida waters, although some have been seen as far north as North Carolina and even New Jersey. Moray eels feed on coral reef fishes. Some moray eels have teeth in the back of their mouths that they use to crush hard-shelled animals such as clams and oysters. What sea creatures other than sharks may be dangerous to swimmers? The great barracuda, moray eels, octopuses, and sea urchins can all be dangerous to swimmers. The Portuguese man-of-war has tentacles that can reach up to 50 feet long and contain specialized stinging cells. If you are not careful, stingrays, toadfish, catfish, and jellyfish can inflict harm on swimmers and waders.